Home > 2016 > 06/02 > Bob Elliott goes out blazing! Bob Elliott goes out blazing! I’m smiling so hard right now at this. With his final column for the Toronto Sun, the legendary Bob Elliott has given us one last incredible, hilarious time warp of a quote from an anonymous scout. I was going to make this a mere item in a Daily Duce, but it’s just too perfect to bury like that. At the bottom of what was a great piece about quick-pitches that led to some dissection of the Jays hitters — Elliott was all business to the last, a total pro — things turned absolutely delightful (for my money, at least). Because, of course, regardless of what Revere has done since the trade (he’s been real bad), the guy they moved him to give a full-time job to — no, not Jay Bruce *COUGH* — has been enormous for this team. And their lack of a true leadoff man is, I’m rather confident, a) not what caused Tulo, Martin, Edwin, Pillar, and Goins to come out of the gate soiling themselves in the batter’s box, and b) kinda also proven irrelevant by the success they’ve had with Bautista — who, sure, is preferably going to hit more often with guys on base than he has been — leading things off. 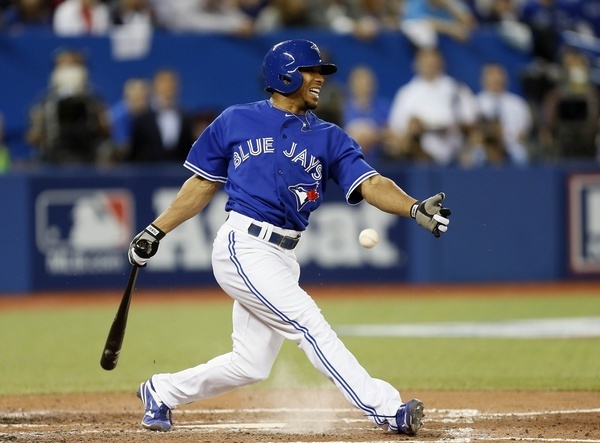 The scout said Bautista should earn points for moving out of an RBI spot as he heads into free agency. I say “somewhat” because, while he is obviously bang on about Bautista earning points for not caring about his arby-eye total, who is he talking to that he thinks teams won’t appreciate that move, what year do they exist in, and how much does it cost for a Diet Coke??? Perhaps I could read that more kindly — maybe the scout means teams are so beyond thinking about arby-eyes that Bautista would earn no extra points by “fearlessly” subjecting himself to a type of thinking that no longer exists outside of Arizona — but why spoil the fun? And, don’t get me wrong, this is all in good fun. While, presumably like a lot of you, I don’t always see things the way Elliott’s cadre of scouts do, that they’re always there to give him a quote speaks to his wealth of contacts and people’s genuine affection for him throughout the sport. For… well… I guess a few reasons, I’m truly going to miss their voices being there. And Bob’s most of all. Jose at leadoff has gotten him a lot more hittable pitches (it seems). Unfortunately the last 4 or 5 days that hasn’t lead to much.